It’s Taco Tuesday! 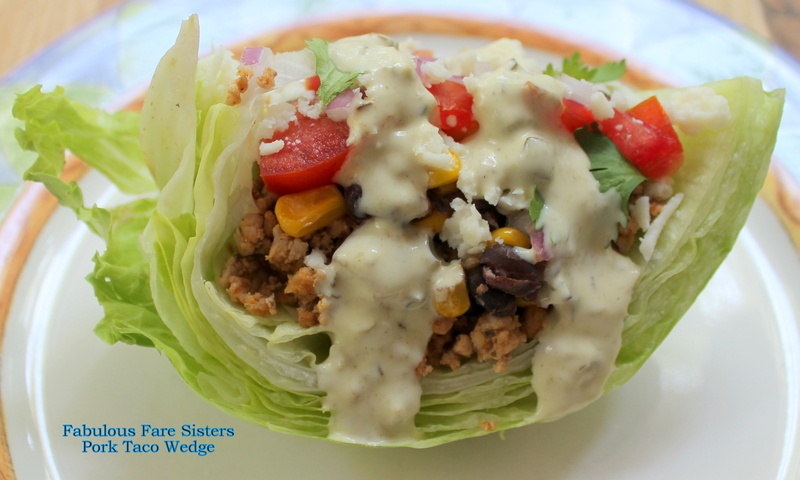 On today’s menu is a simple and very healthy spin on the ‘regular taco‘…Taking all the taco fixings and topping them onto a wedge – then drizzling on a bit of Creamy Avocado Poblano dressing…yum…another great Taco Night!! In one skillet, sauté the corn, black beans and red onion in 1 tablespoon olive oil 5-7 minutes on medium heat; season with salt & pepper, In a second skillet, heat a little extra virgin olive oil; brown the ground pork 8-10 minutes on medium heat until cooked through; adding the spices as it cooks. Cut the iceburg lettuce into wedges (as many as you need tonight – reserve the remaining iceburg lettuce for another day). Gently rinse the lettuce wedges and pat dry. Remove the upper portion of each wedge. 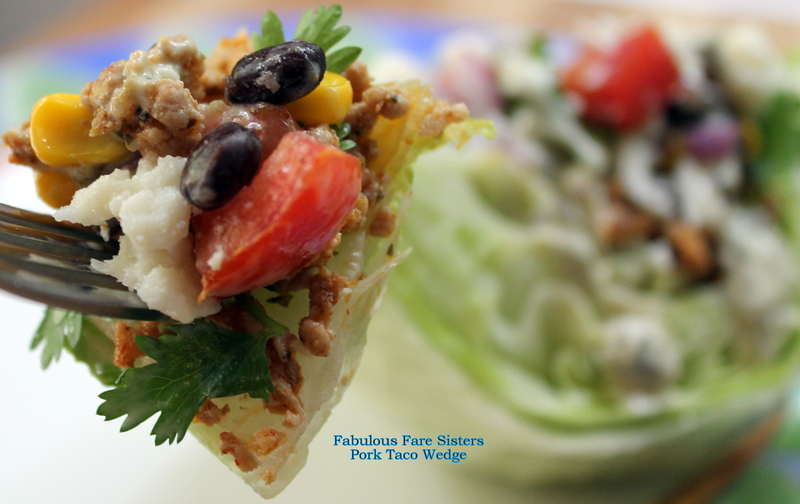 Fill each wedge with some seasoned cooked pork, and top with corn-black bean mixture, diced tomatoes & red onion, cilantro, Cotija cheese and squeeze with some lime. Drizzle on some Creamy Avocado Poblano dressing and serve. So delicious! And crunchy – you won’t miss the shell! This recipe has been shared on Senior Salon, Throwback Thursday, Fiesta Friday, Funtastic Friday, Foodie FriDIY and Saucy Saturdays…go check it out and then visit some other great sites! Oh this looks so good! I’m ready for Tacos now. I’m liking this a lot! I bet that crunchy lettuce was amazing with the rest! Thanks for dropping by Throwback Thursday with this recipe! 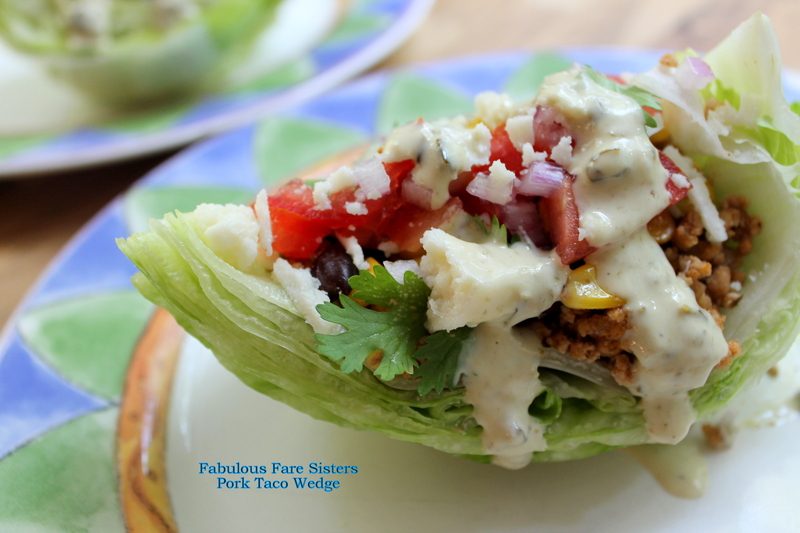 A great taco with all the goodness and so fresh with the lettuce cups! Thanks for bringing this to Fiesta Friday! By the way I like to make slices of the lettuce versus a wedge – I think that idea came from Ina Garten. Actually I mentioned her new book in Lobster Mac and Cheese! This just has me drooling. Wow! I love this idea! !